For other people named Louis Jones, see Louis Jones (disambiguation). 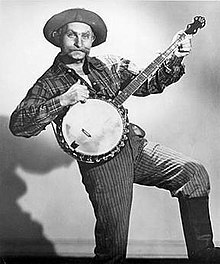 Louis Marshall Jones (October 20, 1913 – February 19, 1998), known professionally as Grandpa Jones, was an American banjo player and "old time" country and gospel music singer. He is a member of the Country Music Hall of Fame. Jones was born in the small farming community of Niagara in Henderson County, Kentucky, the youngest of 10 children in a sharecropper's family. His father was a fiddle player, and his mother was a ballad singer. Jones spent his teenage years in Akron, Ohio, where he began singing country music tunes on a radio show on WJW. In 1931, Jones joined the Pine Ridge String Band, which provided the musical accompaniment for the very popular Lum and Abner show. By 1935 his pursuit of a musical career took him to WBZ (AM) radio in Boston, Massachusetts, where he met musician/songwriter Bradley Kincaid, who gave him the nickname "Grandpa" because of his off-stage grumpiness at early-morning radio shows. Jones liked the name and decided to create a stage persona based around it. Later in life, he lived in Mountain View, Arkansas. Performing as Grandpa Jones, he played the guitar or banjo, yodeled, and sang mostly old-time ballads. By 1937, Jones had made his way to West Virginia, where Cousin Emmy taught Jones the art of the clawhammer style of banjo playing, which gave a rough backwoods flavor to his performances. In 1942, Jones joined WLW in Cincinnati, Ohio. It was there that he met fellow Kentuckian Merle Travis. In 1943, they made their recording debuts together for Syd Nathan's upstart King Records. Jones was making records under his own name for King by 1944 and had his first hit with "It's Raining Here This Morning". His recording career was put on hold when he enlisted in the United States Army during World War II. Discharged in 1946, he recorded again for King. In March 1946, he moved to Nashville, Tennessee and started performing on the Grand Ole Opry. He married Ramona Riggins on October 14, 1946. As an accomplished performer herself, she would take part in his performances. Jones' vaudeville humor was a bridge to television. His more famous songs include "T For Texas", "Are You From Dixie", "Night Train To Memphis" and "Mountain Dew", and "Eight More Miles To Louisville". In 1969, Jones became a charter cast member on the long-running television show Hee Haw, often responding to the show's skits with his trademark phrase "Outrageous". He also played banjo, by himself or with banjo player David "Stringbean" Akeman. A musical segment featured in the early years had Jones and "his lovely wife Ramona" singing while ringing bells held in their hands and feet. A favorite skit had off-camera cast members ask, "Hey Grandpa, what's for supper?" in which he would describe a delicious, country-style meal, often in a rhyming talking blues style. Sometimes he would describe something not so good; i.e. "Because you were bad, thawed out TV dinners!" A resident of rural Ridgetop, Tennessee, outside Nashville, he was a neighbor and friend of fellow musician David "Stringbean" Akeman. On the morning of November 11, 1973, Jones discovered the bodies of Akeman and his wife, who had been murdered during the night by robbers. Jones testified at the trial of the killers, his testimony helping to secure a conviction. In 1978, Jones was inducted into the Country Music Hall of Fame. His autobiography, Everybody's Grandpa: Fifty Years Behind The Mike was published in 1984. In January 1998, Jones suffered two strokes after his second show performance at the Grand Ole Opry. He died at 7:00 p.m. Central Time on February 19, 1998 at the McKendree Village Home Health Center in Hermitage, Tennessee, at age 84. He was buried in the Luton Memorial Methodist Church cemetery in Goodlettsville, Tennessee. Jones recorded for several labels, including RCA Victor, King Records and Monument. ^ a b McCall, Michael; Rumble, John; Kingsbury, Paul, eds. (1 February 2012). The Encyclopedia of Country Music (Second ed.). Oxford University Press. pp. 269–270. ISBN 9780195395631. ^ "Banjo Player Grandpa Jones, 'Hee Haw' Regular, Dies". Washington Post. February 21, 1998. Retrieved January 8, 2018. ^ a b Wadey, Paul (February 27, 1998). "Obituary: Grandpa Jones". Independent. Retrieved January 9, 2018. ^ Cooper, Peter (15 October 2014). "1973 killings brought fear to Nashville". The Tennessean. Retrieved 10 January 2018. ^ Brown v. State, unpublished decision at 1991 WL 242928. ^ Jones, Louis M. with Charles K. Wolfe. (1984). Everybody's Grandpa: Fifty Years Behind The Mike. Knoxville, TN: University of Tennessee Press. ^ Profile, hendersonkyhistory.com; accessed November 22, 2015. Wolfe, Charles K. (1998). "Grandpa Jones". In The Encyclopedia of Country Music. Paul Kingsbury (editor), New York: Oxford University Press. pp. 269–70.